Alright friends, I don’t think I need to reiterate again just how much I love turtlenecks. They are such staples for me throughout the fall and winter seasons. Funnily enough when I was a kid my mom used to make me wear turtlenecks underneath my T-shirts and sweaters and I hated it because most other “cool kids” didn’t wear turtlenecks. Now looking back I think mom was just a pure style genius with a side of practicality! I‘m so glad I grew out of being self-conscious (definitely not completely, still a work in progress) and worrying about what the “cool kids” wore. Turtlenecks are like the Swiss army knife of my closet. Since turtlenecks are traditionally a more fitted garment, they can be worn alone and under almost anything! I find that they really transform my outfits, taking them from a casual cozy weekend to the office and then to a night out with friends. Turtlenecks are also very practical because they add a ton of warmth to an outfit, which is what my mom was doing with my childhood outfits. I love the practicality of turtlenecks especially in the winter and will often just wear a turtleneck for warmth under all my sweaters. I like to use turtlenecks to add a pop of interest in outfits. Whether that be with a classic black turtleneck as I’ve styled below, or with a coloured turtleneck. Below I’ve layered a black turtleneck under my grey sweater, but only allowing the neck and a bit of the sleeves to peek out. I think it’s like adding borders to a picture, but instead I’ve added a thick black border to my light grey sweater, making it pop more. Another way of adding a pop of intrigue in a more obvious way is to style it under a t-shirt or some sort or a piece that has more of the turtleneck exposed. Not only does it keep you warm, it also allows you to wear summer pieces longer, making them great for transitioning between seasons. Here I’ve styled my black turtleneck under a simple shift dress over slim pants. 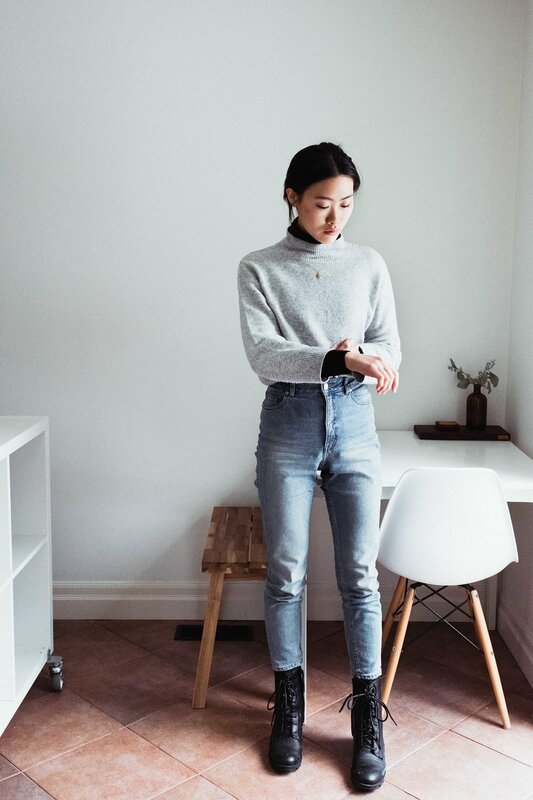 As I mentioned above, turtlenecks are great for a variety of settings, and I personally often wear them to work but I easily style them casually on weekends as well. This is one of the main reasons why I have included multiple turtlenecks in my core capsule, simply because they get a lot of wear. My core capsule is comprised of items that I wear often and through many seasons. It’s definitely still a work in progress and something that I’m developing as I go, but if you’re interested in learning more about my core capsule, you can read about that here in a previous blog post. Below, I’ve styled a typical outfit I would wear to work in the winter. I’ve styled this camel cotton turtleneck under the softest grey flannel, along with a pair of classic black work trousers. To finish the look, I slipped into my black Chelsea boots and accessorized with simple understated gold jewellery for an office-appropriate look. To further demonstrate the versatility of turtlenecks, here is a more casual outfit that you would definitely see me sporting on the weekend. This look is also one of my favourites because it incorporates two hand-me-down item/“stolen” from my parents. Here I’ve thrown an oversized denim shirt on top of my ribbed turtleneck. In this outfit, I’d be ready to catch up with friends in a cafe or run errands on the weekend. Last but not least! This is my take on a classic 90s-inspired look - the spaghetti strap tank layer. Maybe I’ve been watching too many Friends re-runs and am getting inspired by one, Miss Rachel Green. Does anyone else remember this iconic look? For my final turtleneck outfit, I’ve layered a similarly toned spaghetti strap blouse over my tank top, tucked into a pair of black trousers, a finished off with my black Chelsea boots This is more of a clean, feminine look - maybe an outfit for a date night! Well after all this turtleneck talk, maybe you still think turtlenecks aren’t for you, and that’s totally fine! If you’re still interested in trying out some of these tips, maybe opt for a mock neck top as an alternative. 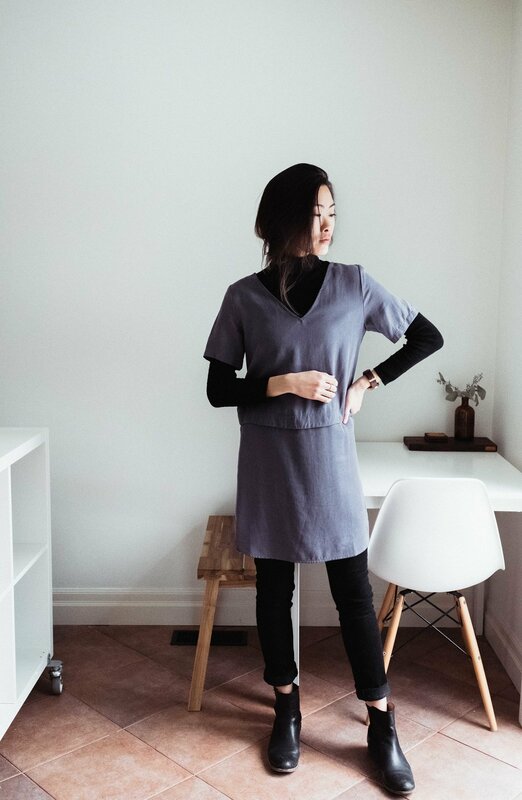 Mock necks have a similar silhouette except there is less fabric and height covering the neck, helping to elongate the neck. Maybe turtlenecks are too form fitting for your liking, try styling them with higher waisted bottoms or with another layer on top. This could be a whole other blog post on its own, so I won’t get too into that! If your turtlenecks are itchy, maybe opt for cotton or a soft merino wool when purchasing a turtleneck. Both of these fabrics are extremely comfortable, not to mention cozy. If you’re interested in reading more about fabrics, I discuss more on wool and cotton in my previous blog post. Now that you know just how much more I love turtlenecks, let me know below your favourite layering tip. I’m curious if you’ve tried any of these layering tricks? Do you have any questions about styling turtlenecks for your body type? I would love to hear your thoughts!